Moonrise above Ben Nevis in Scotland at the lunar eclipse day on July 27, 2018 shown in Peakfinder.org. 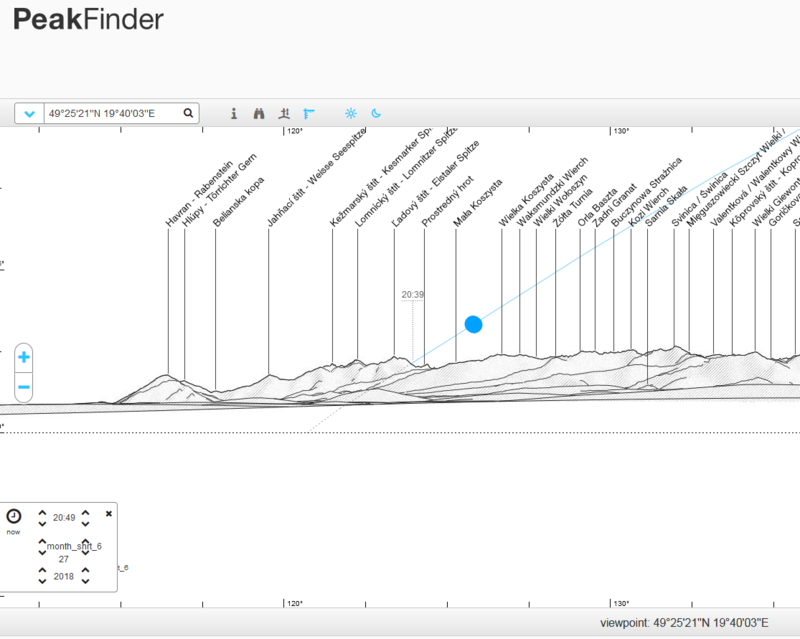 In the 2nd part of this short guide on the Peakfinder.org panorama generator I would like to focus on another kind of observations, that we can enjoy with. There are solar & lunar eclipses. Those celestial events are quite rare (especially solar eclipses) so this is the prime reason, for that we should prepare as best as possible. 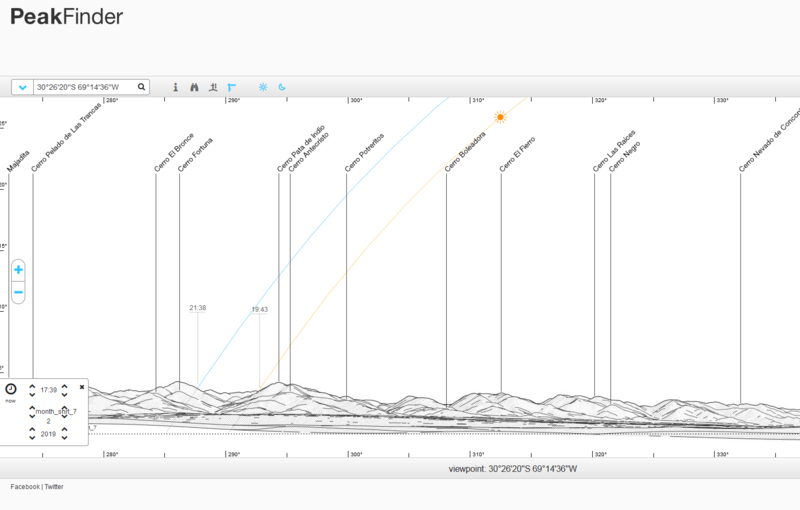 Previously I have explained how to use the Peakfinder.org panorama generator in conjunction with the solar and lunar ephemeras. I have found, that this website can be helpful for planning the solar & lunar eclipse observations. 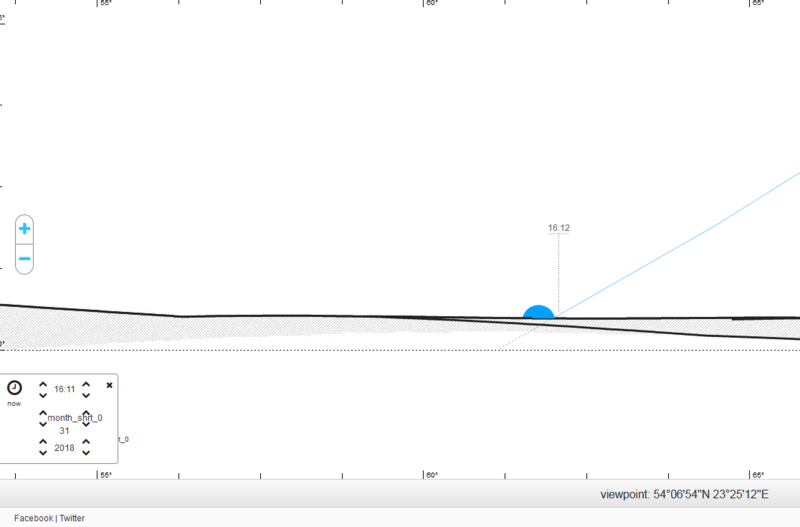 Despite of no proper signatures (Sun in Peakfinder always looks the same, Moon changes due to phases) this matter is possible when using appropriate websites for it. – Mooncalc.org – with rough Moon ephemeras for your location. 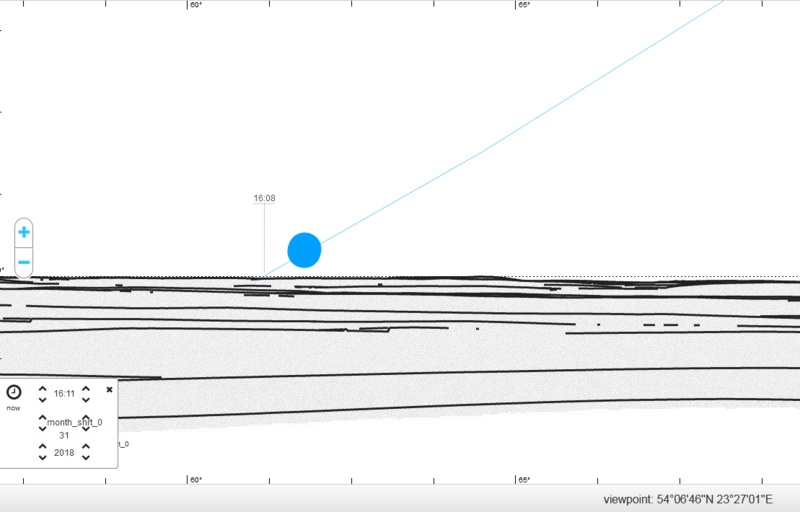 – Xjubier free.fr – with the most detailed interactive lunar eclipse maps. 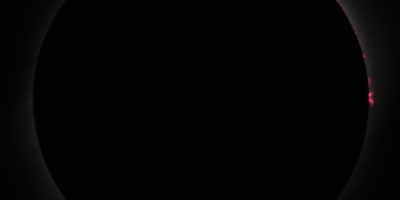 I would like to show the solar eclipse issues first, because (at least) for me is easier to demonstrate it. Aforementioned NASA Eclipse home page provides a detailed Google Maps-based circumstances for almost all solar eclipses between 2000BC and 3000AD. I will focus on a few forthcoming eclipses. It’s good to mention, that this website can be useful for stagering your photos not only for total or annular eclipses but for partial ones too. 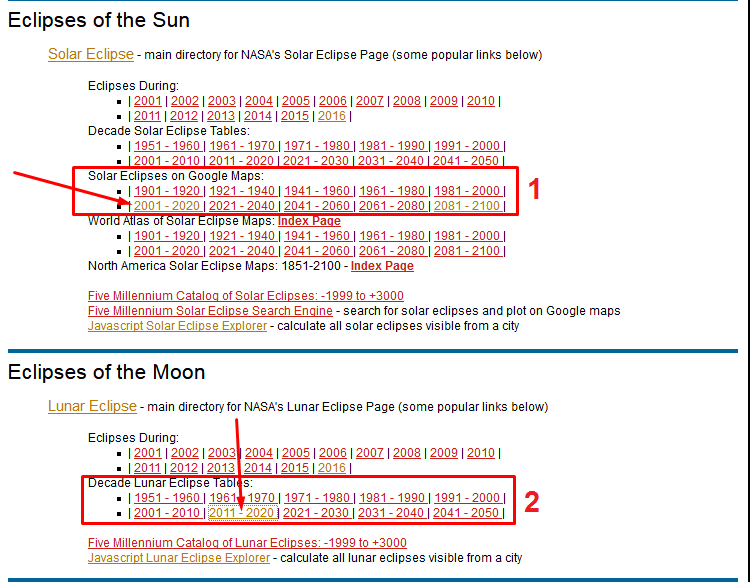 When you browsing the Nasa eclipse web page you have a few choices of the eclipse databases (Pic. 1). Pic. 1 The NASA Eclipse web page with the solar and lunar eclipses database: 1 – selecting solar eclipses for 2001-2020 period, 2 – selecting lunar eclipses for 2011-2020 decade. All databases has been divided on the decades, from which you can choose a single solar eclipse. Is advisable to click on the link to Google Map rather than Global Map (Pic.2), because it will be easier for you go get around with. Pic. 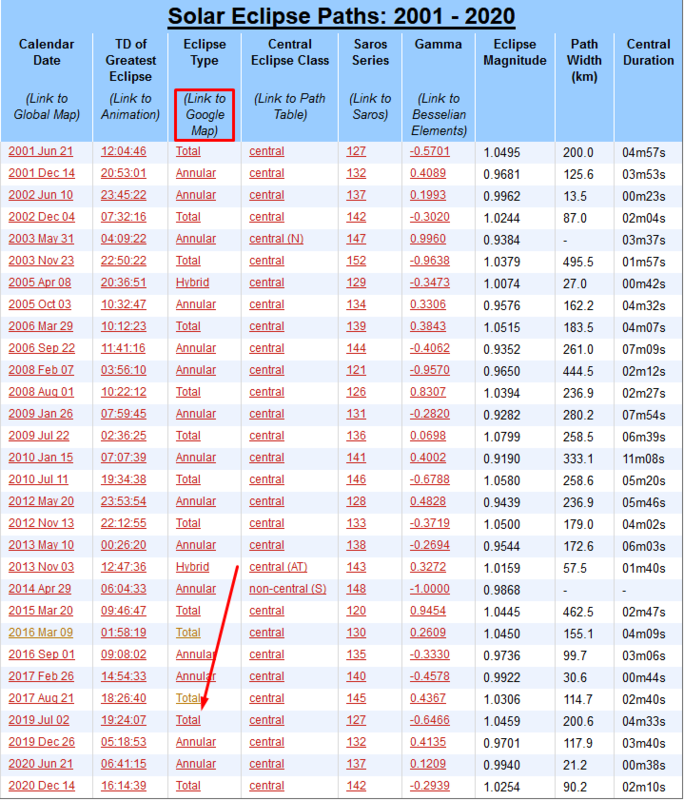 2 The NASA eclipse database for 2011-2020 decade with “Link to Google Map” row highlighted and a first forthcoming total solar eclipse from now. In this section you can find the total and annular solar eclipses only. 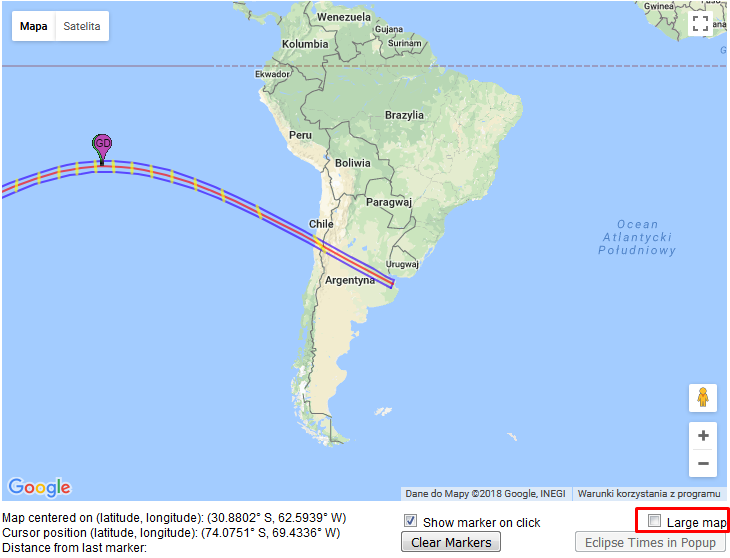 Basically there is no google map provided for partial eclipses, however bear in mind, that either total or annular solar eclipse occures as a partial one on wide area. 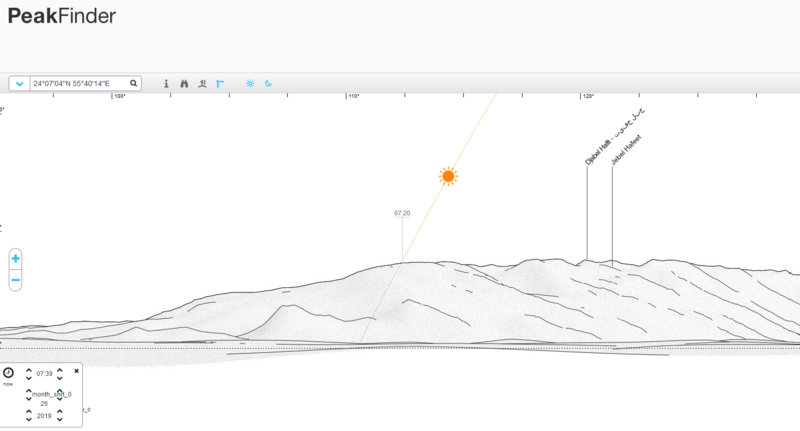 When you are in, click “Large map” and find the observation site taken into your consideration and put marker there (Pic. 3,4). I will not explain this profoundly now. 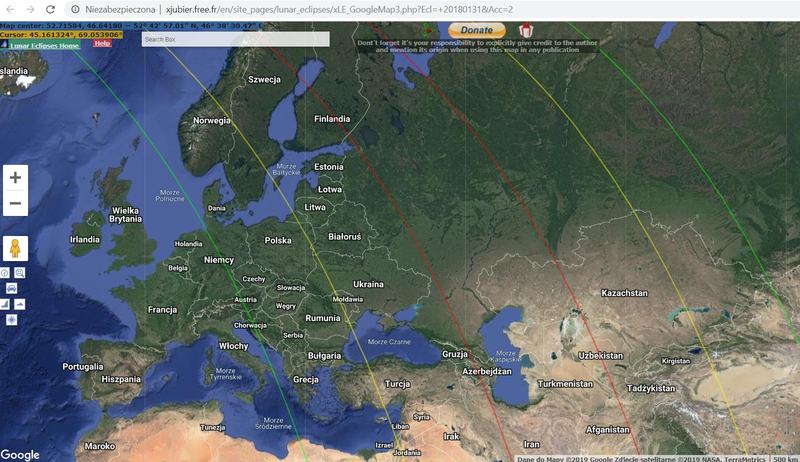 If you want to know more read my previous articles about the vizualisation of total solar eclipse in Google Earth. Pic. 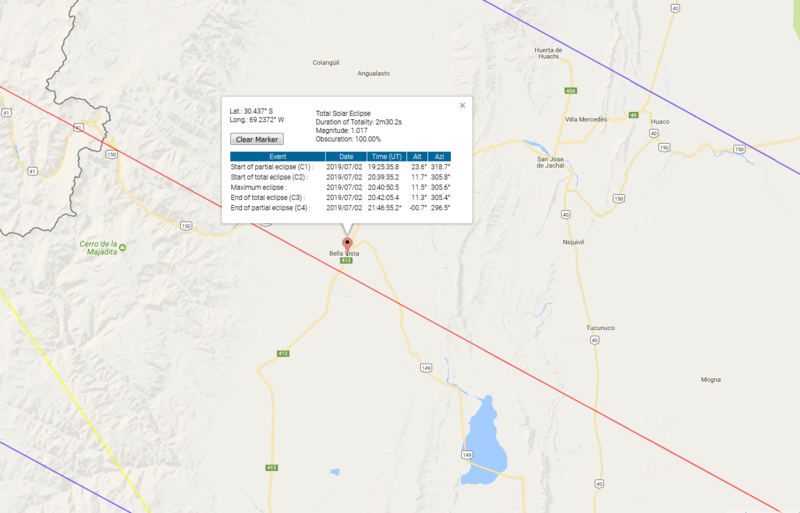 3 The total solar eclipse path shown on Google Maps. Click “Large map” on the right bottom corner to make it much bigger. Pic. 4 Then find your observation site and put the marker. In my case this is Bella Vista in Argentina. 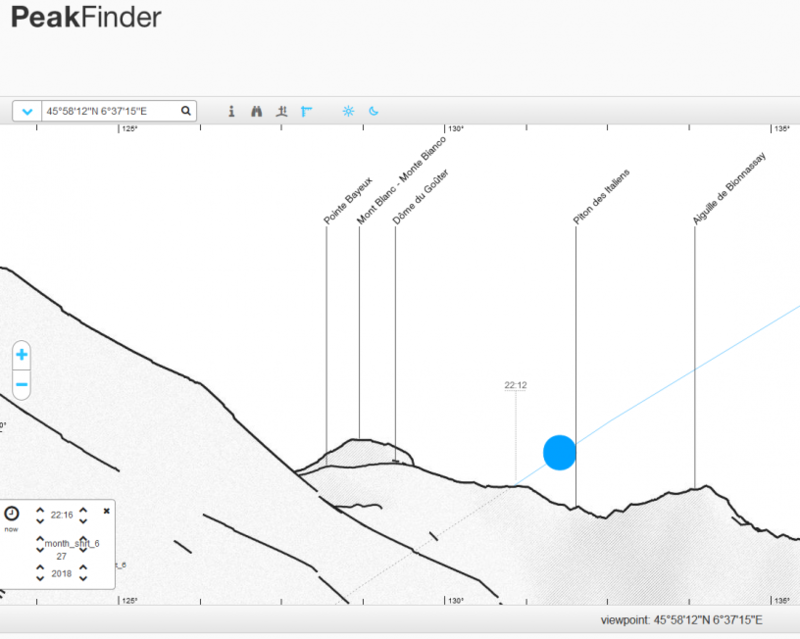 When you have got your location ready open the Peakfinder.org website and find the same location there (Pic. 5) using the “Maps” option. Sometimes your location may be used repeatedly and at the outcome found in far different place (loke Cambridge UK, Cambridge US or York UK, Youk WA, etc.). When you have issues like this put another (bigger) town into the bracket and check which one matches up (Pic.5). Pic. 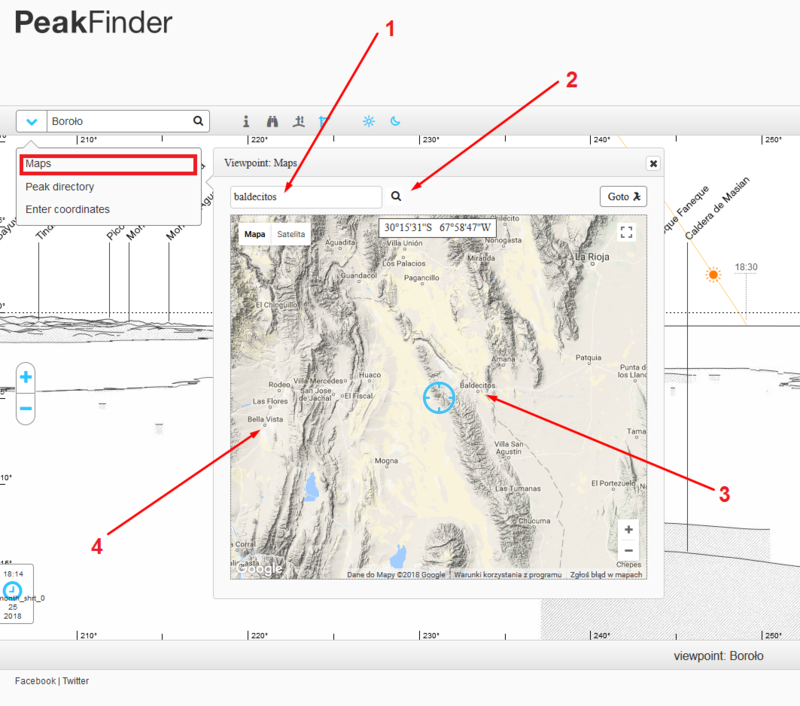 5 Finding your location in Peakfinder.org website: 1 – Name of the location (town/city) in the bracket, 2 – Search option, 3 – The most suitable location found, 4 – Our location, that the same name appears in Spain. 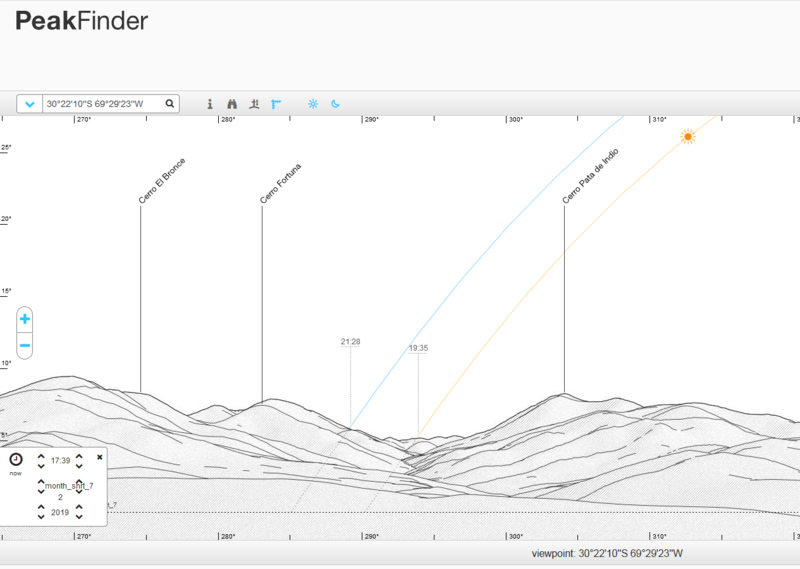 Once you find your location click “Goto” in Peakfinder and enjoy your view! (Pic. 6). Remember, that you have to adjust your local time to this one given by Nasa webpage (GMT 0). For this place (Argentina) it will be GMT-3). Pic. 6 The Sun position at moment the totality near Bella Vista in Argentina on 2nd July 2019. 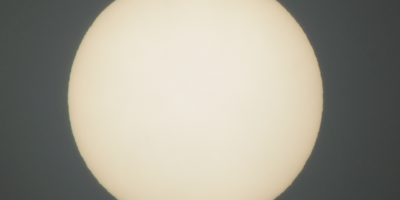 For this location Sun seems to be too high to snap it beyond mountains. You can find a better place then (Pic 7,8), located not far from your initial location. Pic. 7,8 Another potential observation site (near Arrequintin church) on the road no150 headed Chile border. 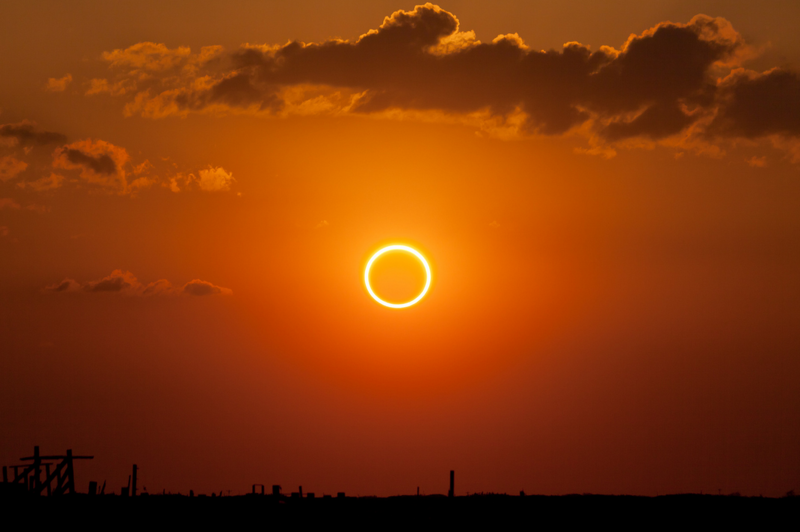 Next solar eclipse is annular one. The path starts in eastern Saudi Arabia and proceeds towards south east via Quatar, United Arab Emirates and Oman. There are a lot of places, where you can take pictures a deep partial eclipse with Al Hajar mountains, that falls a tens kilometers from the path of annlarity. The obscuration dorung maximum eclipse will reach near 90%. I found one place in eastern United Arab Emirates (border city Al Ain) with amazing view of this eclipse just after sunrise (Pic. 9,10). Pic. 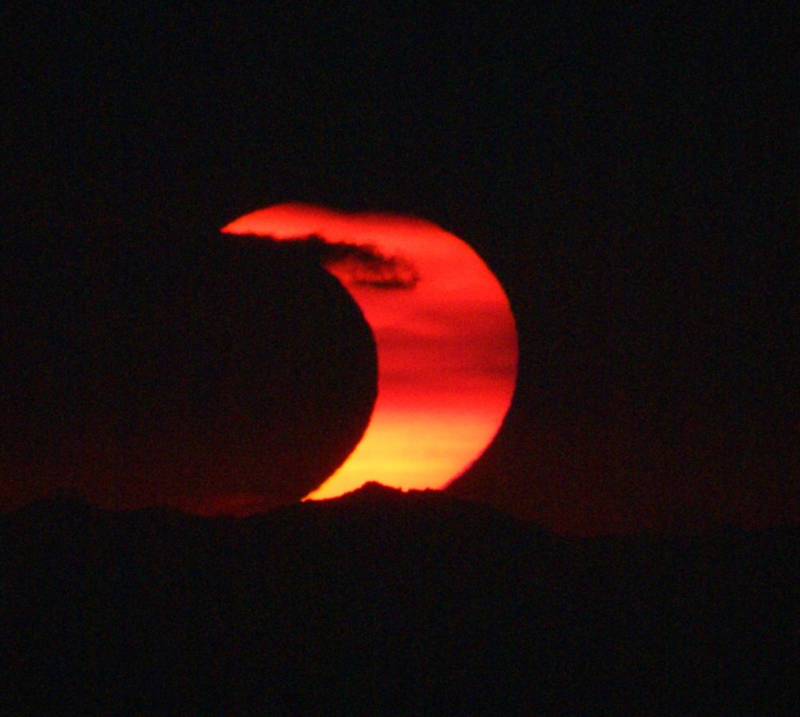 9,10 The partial solar eclipse after sunrise above Al Ain in United Arab Emirates near Oman border. The greatest eclipse will occur around 30 mins after sunrise above Jebel Hafeet on 26th December 2019. Pic. 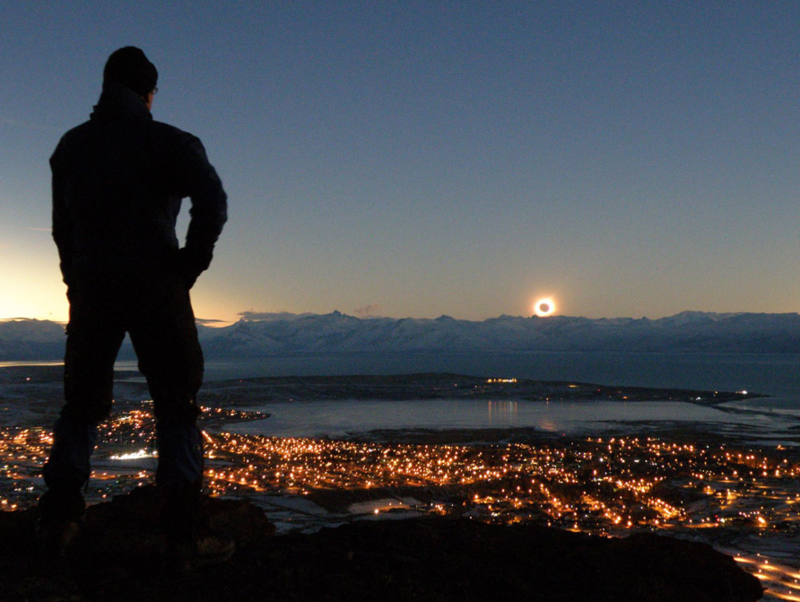 11 Total solar eclipse on 11th July 2010 captured above Andes (El Calafate) just before sunset, Janne Pyykkö, apod.com. In case of lunar eclipse this excercise is not straighforward as could be, as long as you decide to use the Nasa Eclipse Web Site for it. The Nasa Eclipse Web Site doesn’t supply the lunar eclipse data with Google Maps. Only general patterns in .pdf format are available. Once you open the calendar date of lunar eclipse link you should have all general information as per below (Pic.17), whilst the scant eclipse graph on the bottom (Pic. 18). You need to zoom it in as much as possible to figure out the eclipse phase in your location. Pic. 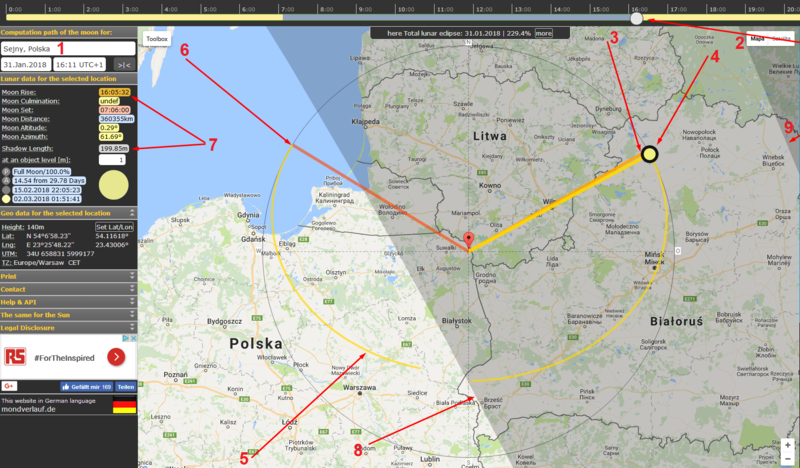 17,18 The lunar eclipse of 31st January 2018 pattern provided by Nasa Eclipse Web Page: 17 – general view, 18 – Eclipse graph with red arrow, that shows the area of consideration (north-east Poland). Red arrow on pic. 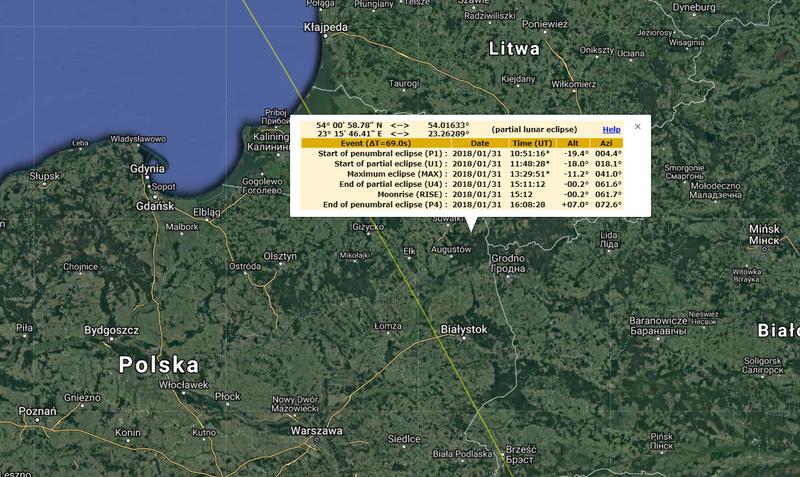 18 shows my observation site in extremely north east part of Poland. Only there end of partial phase will be visible. I would like to check how my observation site will look during this moment. Having this poor graph only I can’t really find my place in Peakfinder.org. Much helpful will be the both Mooncalc.org (Pic. 21,22) and new lunar eclipse interactive maps provided by Xavier Jubier (Pic. 19, 20), which you can use along with Mooncalc.org to figure out where exactly the eclipsed moonrise or moonset is going to happen. Pic. 19, 20 January 31, 2018 total lunar eclipe circumstances for eastern Europe and north east Poland, where moonrise will occur just before P4 contact. Pic. 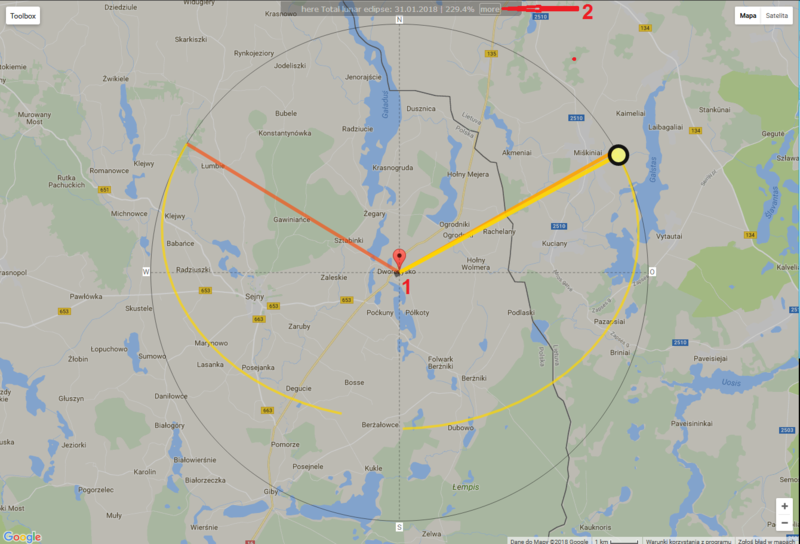 21 The Mooncalc.org interface with considerated observation site in Dworczysko near Sejny: 1 – Location bracket (Nearest town), 2 – Time (top bar to scroll reft-right, yellow – Moon above the horizon, blue – Moon below the horizon), 3 – Moonrise azimuth, 4 – Current Moon position, 5 – Moon track across the sky, 6 – Moonset azimuth, 7 – Current local circumstances, 8 – Terminator line, 9 – Civil dusk line. Pic. 22 Close up view on the observation site (marked number 1). On the top you should have a lunar eclipse toolbar available on the intermittent basis. Clicking “more” (marked number 2) you will have general information about previous and forthcoming lunar eclipses possible to see from this location. Unfortunately not useful for our purpose. When you have prepared the observation site in Mooncalc.org server go to Peakfinder.org and find your location there. Once you do this you can check the best place for lunar eclipse observation. 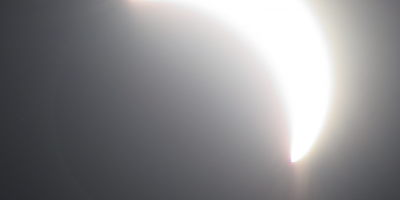 On 31st January 2018 partial eclipse ends at 16:11 GMT+1. It’s going to be really hard to see last minutes of this partiality from there (Pic. 23,24). Pic. 23 Moonrise above Dworczysko village near Sztabinki lake, 31.01.2018, 16:11. Pic. 24 Moonrise from hill near Weresowszczyzna, 5km ahead from last position, 31.01.2018, 16:11. Maybe this example is not easy to demonstrate, so let’s take a look for next lunar eclipse, that will occur in late july 2018 (Pic. 25, 26). Now I took into account 3 different locations, from where moonrise above mouintains is possible on eclipse day (27.07.2018). Pic. 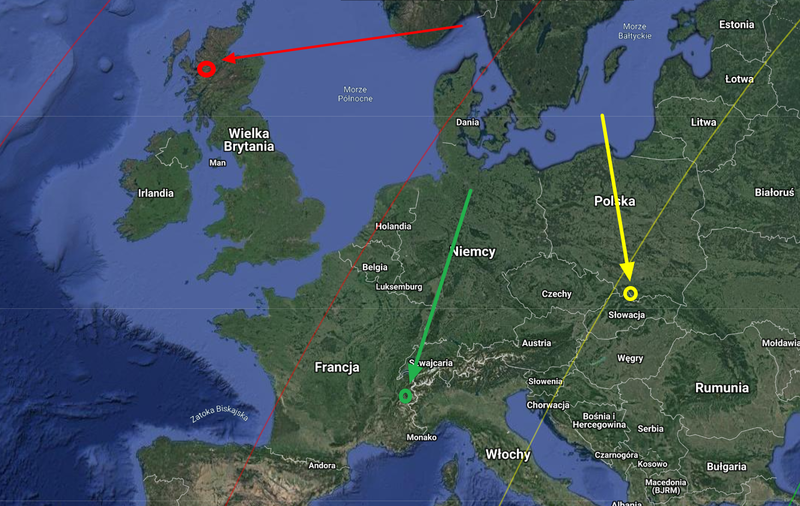 25 Total lunar eclipse on 27.07.2018 circumstances with 3 various locations: 1: Chyzne (Poland), Oex/Sallanches (France) and the Gulvan peak near Fort William (Scotland). Pic. 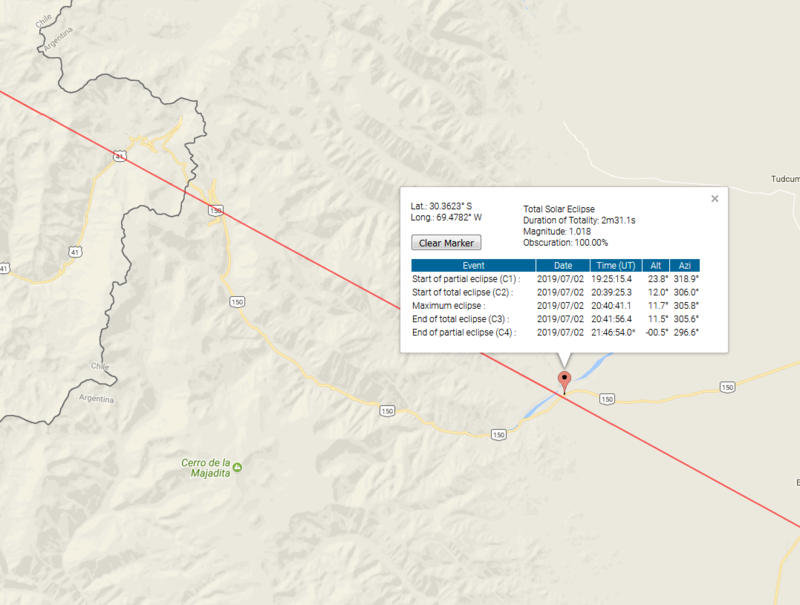 26 The same locations shown on mre detailed, lunar eclipse interactive map provided by Xavier Jubier. First one refers to beautiful mountainuous corners of Lesser Poland. One of them is the Chyzne, border villge with Slovakia, from where partially eclipsed Moon will rise above Tatra Mountains (Pic. 27). 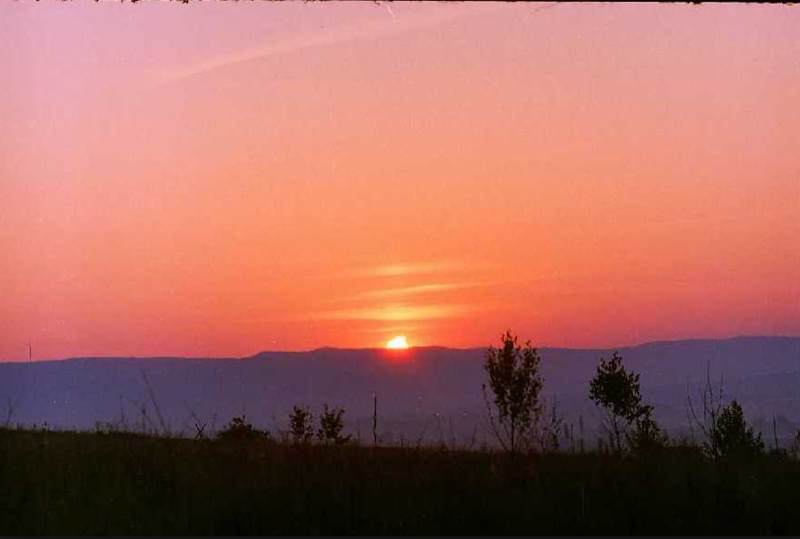 It can be seen from slovakian Orawa also (Trstena, Trvdosin). Pic. 27 Moonrise above Tatras seen from Chyzne (Poland) on 27 th July 2018. The Chamonix region attract the tourists year by year. There is a lot of facilitues, picturesque views and also the greatest opportunity to see the highest peak in Europe – Mount Blanc from very short distance. It can be a perfect spot for lunar eclipse watchers on 27 th July this year. You just need to go to Sallanches and set your equipment just a little bit north from the village to see rising eclipsed Moon above Mount Blanc (Pic. 28). Pic. 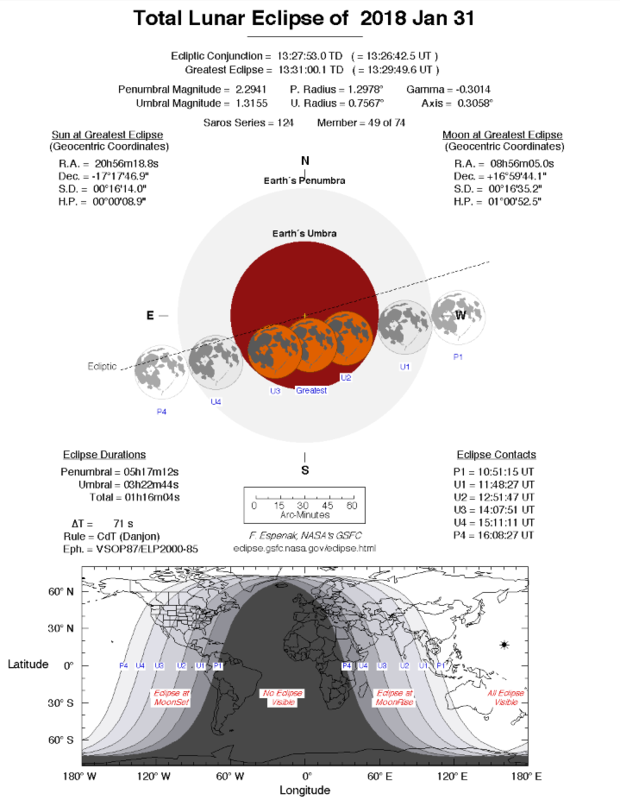 28 Partially eclipsed Moon will rise above the Mount Blanc massif on 27 th July 2018. Total eclipsed Moon will rise in Great Britain. Scotsmans will have a great opportunity to see this occurence right above their the highest mountain – Ben Nevis. They only need to flock near Fort William alongside the Loch Eil. 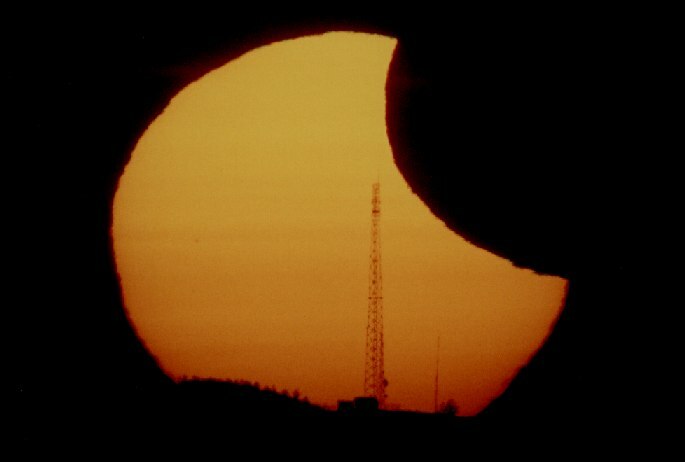 There a brown Moon should rise around 22:10 at the very end of totality. For them, who wants to see the total phase much longer is advisable to reach the Gulvain peak, that rises above earlied mentioned Loch Eil (Pic. 29). Pic. 29 Total lunar eclipse on 27 th July 2018 with moonrise above Ben Nevis community seen from the Gulvain peak located on the opposite side of the River Lochy valley. 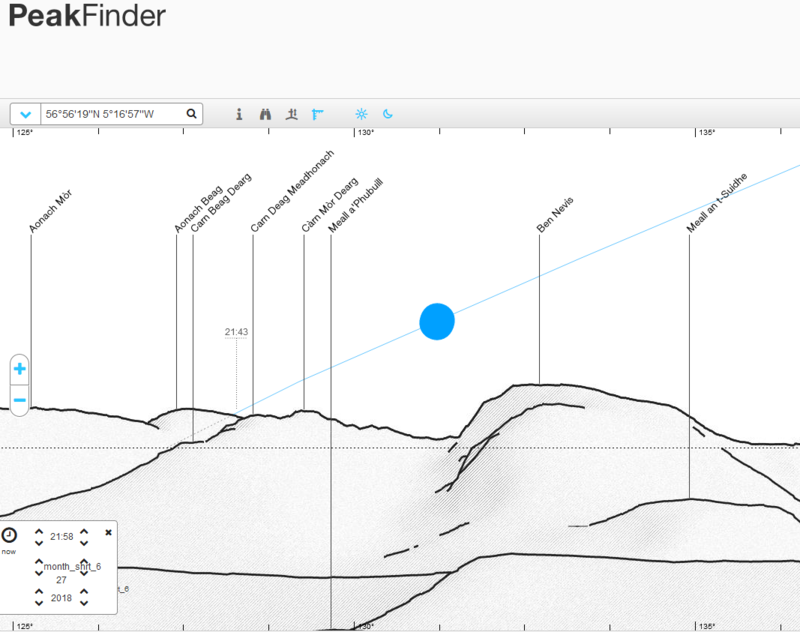 Despite of lack the appropriate signage (solar & lunar eclipse) in Peakfinder.org, at least for the time being I hope, that it will help you to plan roughly your observation site. There are a simply website tools and I am pretty sure, that everyone should combat with it. At the finish I would like to show a few examples, tat I found in the web. Unfortunately I have not occasion to carry out this kind of observations yet. Pic. 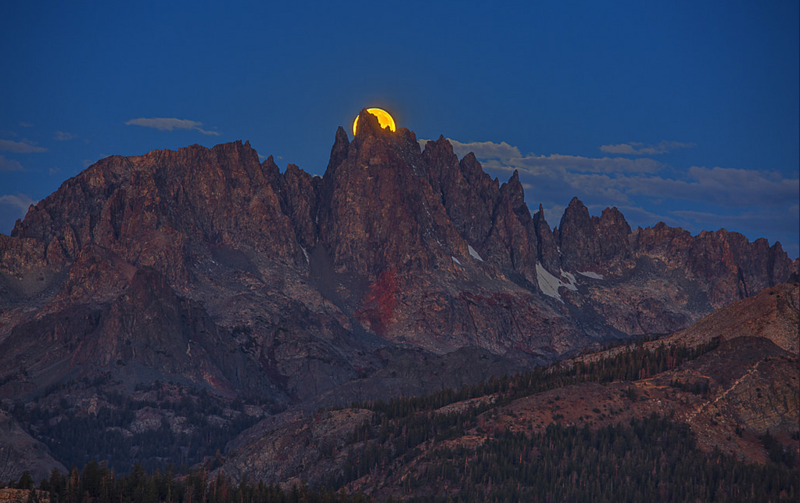 30 The mooset behind the Minarets (California) in the final phase of total lunar eclipse on 8 th October 2014, Jeff Sulivan, flickr.com. Pic. 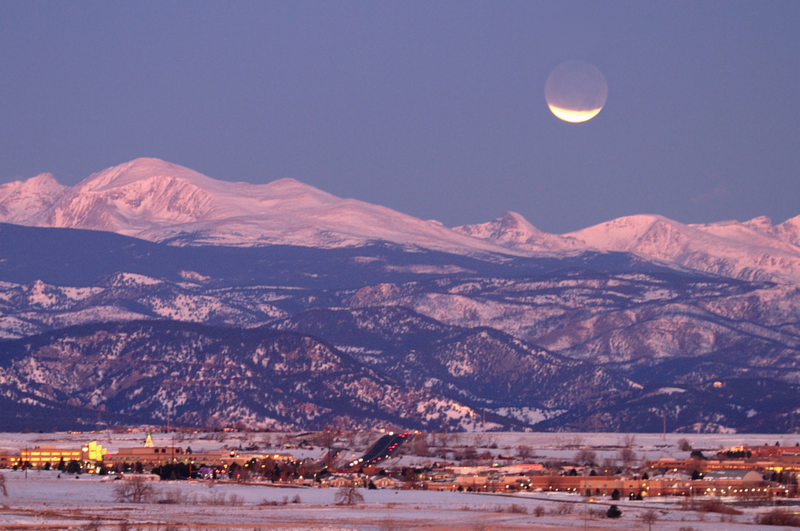 31 The mostly eclipsed Moon sets above the Indian Peaks (Colorado) on 10th December 2011, Pat Galnes, flickr.com. Pic. 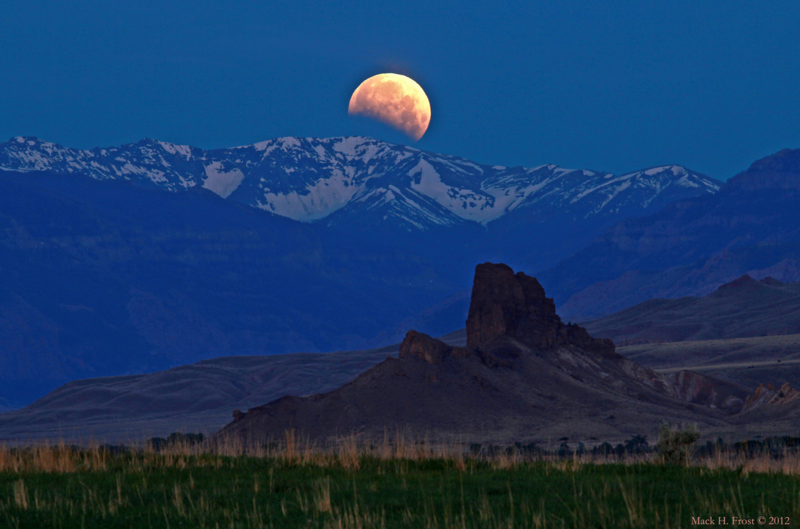 32 Partially eclipsed moon setting over Absaroka Mountains (Wyoming) on 4 th June 2012, Mack Frost, flickr.com.